Serum 1000 is based on environmentally friendly hydrogen peroxide (H2O2). Serum 1000 degrades into water and oxygen O2. The combination of Serum 1000’s unique ingredients, mode of operation (Lift-Off Technology) along with special application tools makes this system the fastest, most efficient and most economical method used by the restoration industry for cleaning and removing organic/biological contamination from building structures. Serum 1000 reduces the manual effort, completes projects faster and increases your profits. 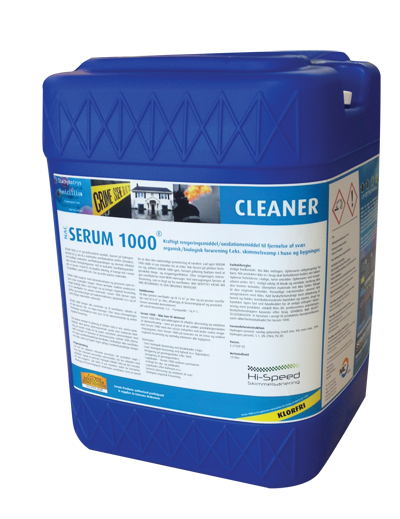 Serum 1000 is the perfect choice for small as well as large cleaning projects. Serum 1000 was developed as a consequence of the enormous damages caused by hurricane Katrina in the U.S. in 2005. Because of the unique product features Serum 1000 can be used with great success for tough cleaning jobs. Serum 1000 will in a sovereign way clean and oxidize organic pollutants and at the same time eliminate all odours. • Severe biological contamination by sewage damage, etc. •	Severe biological contamination by body clean-up etc. (body liquids). • Cleaning up crime scenes, for example blood. • Odour damage – Serum 1000 oxidizes permanent residual odour from smoke and soot damage. • Odour damage after cat urine, rodents (e.g. rats) etc. • General cleaning and oxidation of heavy biological/organic pollution. Off-gassing test from Eurofins available. Apply Serum 1000 with the Serum sprayer or Airless sprayer. Wear appropriate personal protection equipment (PPE) when using Serum 1000. Coverage from 8-25 m2 per litre depending on severity of contamination as well as absorptive capacity and porosity of the surface. Do not delute Serum 1000. Specially formulated additives that optimizes/accelerates Serum 1000. Serum 1000 Accelerator is a designed additive to cause Serum 1000 to perform at a higher level than the Serum 1000 by itself. Serum 1000 for years has performed flawlessly at cleaning all organics and bleaching some of the organic stains that mould leaves behind. The Accelerator is designed to cause Serum 1000 to create billions of hydroxyl radicals to super charge it's bleaching qualities. Now with the Accelerator, you can clean the organics faster because of it's super excited state and be assured that all the staining will be bleached away improving the esthetics of all surfaces being cleaned. DO NOT MIX THE ACCELERATOR UNTIL YOU ARE READY TO SPRAY! Pour 5 liters of Serum 1000 into the Serum Sprayer. Add 120 ml Serum 1000 Accelerator using Pro-Blend bottle dosing. Immediately screw pump into the sprayer. Do NOT shake. Start treatment immediately. Pour 1 liters of Serum 1000 into the Serum Sprayer. Add 24 ml Serum 1000 Accelerator using Pro-Blend bottle dosing. Immediately screw pump into the sprayer. Do NOT shake. Start treatment immediately. Pour entire contents of this bottle (Serum 1000 Accelerator) into the 19 litre container of Serum 1000. Do NOT shake! Place the Airless Sprayer pickup tube into the 19 litre container with the just blended Serum 1000 and start treatment immediately. Spray the accelerated Serum 1000 on all surfaces in the contained area as normal. Use a stiff bristle deck brush to agitate areas of thick visible organic contamination or heavy dark spots while spraying those areas with accelerated Serum 1000. You should experience profuse foaming from areas of living organisms. Re-spray foaming areas after about 10 minutes. If no more foaming, that area is completed. If it foams again, re-spray with the accelerated Serum 1000 until foaming stops. Wait at least one hour for surfaces to dry, then HEPA vacuum all surfaces in the contained area.